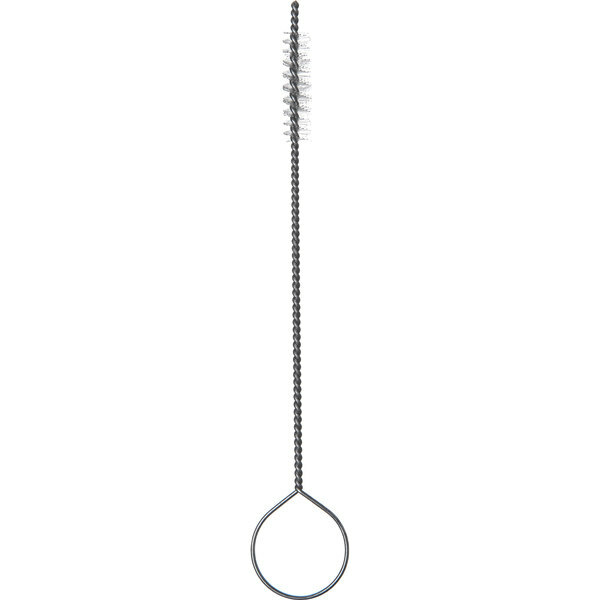 Use this Carlisle 4015700 Sparta beer tap line brush to maintain quality control and prevent bacteria buildup in your equipment from frequent use. 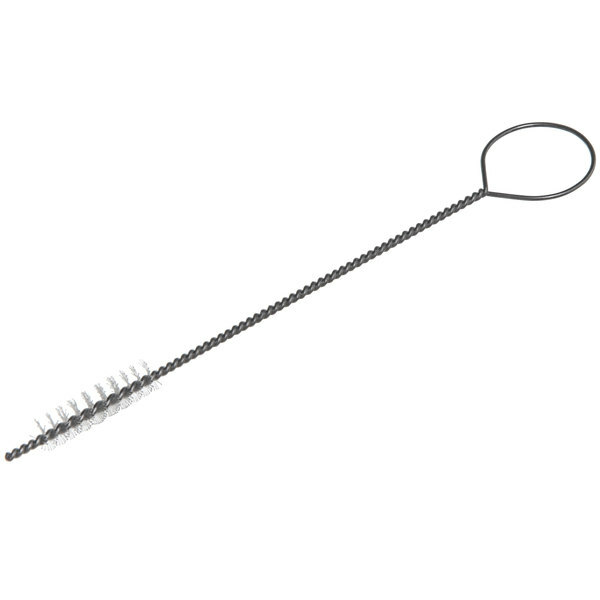 This flexible brush features polyester 1/4" diameter bristles and it easily can reach tight spaces in your equipment. It's useful for cleaning spouts, taps, plungers, tubes, and other equipment fittings. Perfect for restaurants and bars, this brush is constructed from FDA compliant block and bristles. Use this brush to continue serving patrons safe and high-quality product. Good basic tap cleaning brush. No complaints. We use these a lot and they seem to be holding up well. I would definitely purchase these again. i originally got this in hopes it would work to clean my daughters sippy cup straws. its a bit too stiff for that in my opinion, although it does work decently. i now instead use this to clean the small areas in my Keurig coffee maker and it works great for that! I could definitely see it working lovely for its intended purpose on beer taps as well! This little brush is great for cleaning hard to reach places in small items. You can use it to clean pastry tubes, but I also use it for cleaning our water pump. It’s gentle enough that I don’t have to worry about damaging any internal components. Very tiny brush. I wish it also have bristles on the tip. Other than that, is is a handy little brush that can clean tiny sopts. Very pleased with this little brush. We have stout taps for nitro coffee and it's great for cleaning those longer nozzles daily without disassembling them. I use this cleaning brush on the creamer head. The strength of the brush is excellent and it does not bend easily, so you can clean the nozzle easily. I have had a hard time finding the right brush to clean my tea urn spouts with. That ended when these came in and made that job much quicker and they do a great job. The standard beer tap line cleaning brush at a very good price. We will be buying more a would definitely recommend for anyone to purchase. I purchased the Carlisle 4015700 beer tap line cleaning brush to use in our bar. It is handy to get all the gunk out of the beer lines when changing the taps. Nice tiny brush for cleaning the metal spouts of the tap lines. Good also for general purpose bar cleaning like drip trays and soda gun holsters. Good bush at a great price. It is very small, and gets into tight places very easily. I would recommend this tap line brush, it is a great deal. Well built little brush made of quality materials. It is small enough to fit where I need it and strong enough to really clean the small places. There is nothing like drinking fresh tasting beer. This beer tap line cleaning brush did its job and cleaned my beer lines to my kegerator. Handy little tool at a great price, the best I have seen anywhere. There is nothing like a great product at an amazing price. Highly recommended. The Carlisle Beer Tap Line Cleaning Brush is a sturdy little product good for getting into hard to reach places, and strong enough to do a good cleaning job once it get there! This Beer Tap cleaning brush is all some. I use it to clean my coffee pot, and tea maker. It fits perfectly in spall places to clean, you'd be supprised at the uses for this brush. What a great product! Cleans taps very well. The bristles are sturdy and will hold up great! I would say this is a must have! Every single bar needs to invest in these. These keep our taps clean and free from bacteria and aid in the dispense of our beers on tap. This is a must have item to keep your lines clean. It holds up well to use and why not have it if it can keep your beer tasting great? Great small brush to keep your beer tap lines clean. 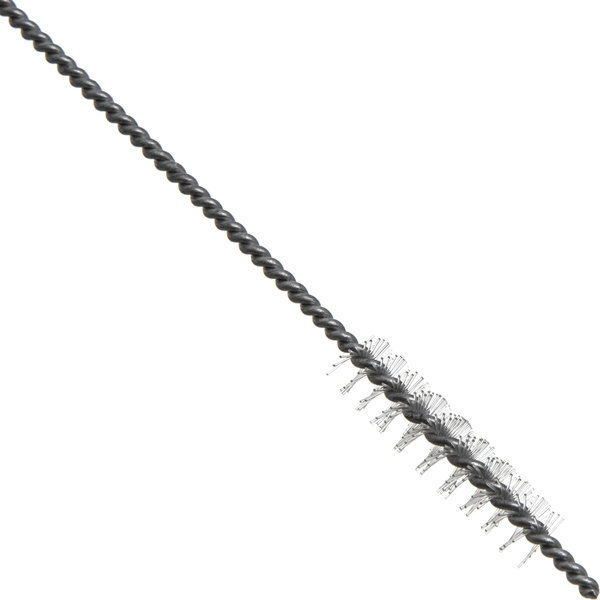 The bristles hold up well and the handle is long enough to help make the job easy and fast. Great brush to clean the beer machine with. It will work wonders for such a small brush i recommend this to any bar owner. Love it, easy clean. Excellent product for any small or hard to reach item. You can maneuver it around to clean the smallest area or in the curves of small items. Good item for the price. Flexible. We use these to clean the lines twice a week and the stuff we find them always amazes me. Definitely worth the couple of bucks you will spend on them. We use these to clean out our quick racks at the bar. They are perfect for reaching into corners and getting out the grime that a washcloth simply cannot reach. 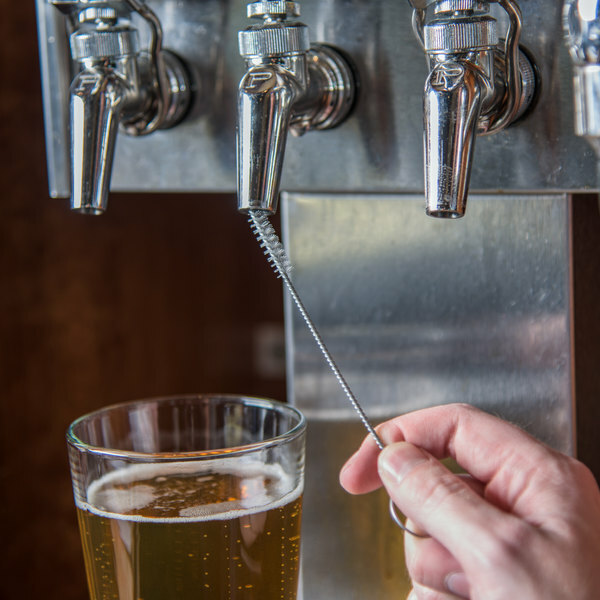 These beer tap brushes fit perfect inside the beer taps to clean. You'd be amazed at the amount of yucky that builds up. They also fit perfect in the sink stoppers to clean the mildew out that can build up within a week!